In 1981 life in Poland changed. Not only social or political life. Visual reality changed also. It was like a time of great feast. For the first time in years people showed without fear, what they feel and think. They also looked fearlessly at the camera. Their faces were full of happiness, pride and hope. I experienced then a kind of illumination – I saw everything very clearly and realized that I want to take photos. And I knew how I want to do it. At the same time, documenting the events of those days, I felt that photography alone could not show and explain the complexity of the situation. The idea of Photodiary was born in my head at that time. The martial law of December 13th 1981 brutally interrupted that process. I quit photography for a while. Life became grey, sad and gloomy again. The “socialist norm” took over and normalization often meant tragedies. A poem by Czesław Miłosz A Song on the End of the World (1943) where the author writes about the end which “is happening now” and is quite ordinary, was the perfect reflection of my feelings at the time and it became a motto for my project. It’s full title was: Photodiary or a Song on the End of the World. When one day I saw a photo of a friend photographer who made a handwritten text underneath, I experienced another illumination – I have to sign myself the photos! This way I will be able to show exactly what I think. And when my friends send me from Paris a tiny pocket camera with a slightly cosmic name Olympus XA2, photographing in the streets became quite easy and XA2 became my faithful companion for many years. I began the project in November 1982. The earliest Photodiary pages were small photographs pasted onto A4 typewriter paper that had been cut to square format. Despite the constant shortages so characteristic for the economy of People’s Poland, I had managed to build up a stock of art paper and glued the pictures onto it using gum arabic. With time, the paper yellowed nicely, the glue caused the pages to warp, and the black marker captions turned purple. Then I bought a masking frame in Germany to cover the wider margins and started creating the Photodiary pages directly on photographic paper. I also put the captions on it, though this was more difficult. Depending on what I wrote with, my handwriting changed. Every mistake or blot meant I had to make a new copy. Dokument, a Czech paper brand, writing on which was much easier, created great prints. Today I use a printer and employ two page formats: 21 x 21 cm (as with the original typewriter paper) and 30 x 30 cm. This allows me to create more interesting, more diverse sets. I think over 32 years I must have made some 10000 pages. Photodiary was exhibited in more than 20 individual shows in Poland and abroad, and I was also showing it in numerous group shows. I have shown Photodiary in various places: at official galleries and private homes, in avantgarde exhibitions and independent exhibitions at church spaces. The Photodiary pages hung on strings stretched between trees in Turno (1984) – the heat caused them to curl and they needed to be removed quickly. They hung on a 40-metre-long rope in the Dungeons of Manhattan in Łódź (1989). In 1985, West Berlin’s Zyndikaat Gallery was jam-packed with 600 pages, and the ceiling-suspended sheets came off during the preview. From Berlin the exhibition was shipped to Rome, where I was on a residency at the Pope John Paul II Institute. The suspicious Italian customs officers refused to release the boxes for several months. The Rome show never happened and when the pictures returned to me half a year later, many pages were missing. 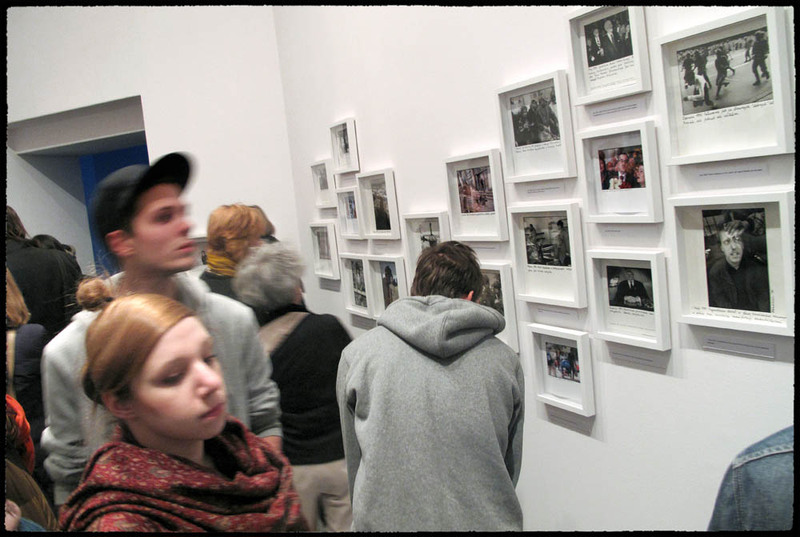 A set of 80 pictures made a US road show (1987-1988), where it was shown at small university galleries as part of the exhibition Private Photography: Out of Eastern Europe. The curator, John P. Jacob, never returned the photographs. In 1990, the Polish Foreign Ministry commissioned me to create 60 sets of 30 photos each (I dried the 1,800 prints using a single two-sided drier!). I put captions in 10 languages, and the sets were exhibited at Polish embassies in over 60 countries. One of such sets (pictures pasted onto aluminium sheet-metal) returned to me years later. Usually I know how I will sign the photo the moment I take it. The image and the text become an inseparable whole. My captions are very different. Sometimes it is only information, sometimes my personal comment, a play of words, sometimes an unclear text, kind of camouflage, which only insiders can understand. Photodiary is a child of People’s Poland. It had originally been created as a token of protest, an attempt to rectify reality, to show it without embellishment, as it was. But it also a kind of diary, a record of my life. I was not surprised that the censors often told me to remove many images from exhibitions. I fought for those interventions to be marked and visible. 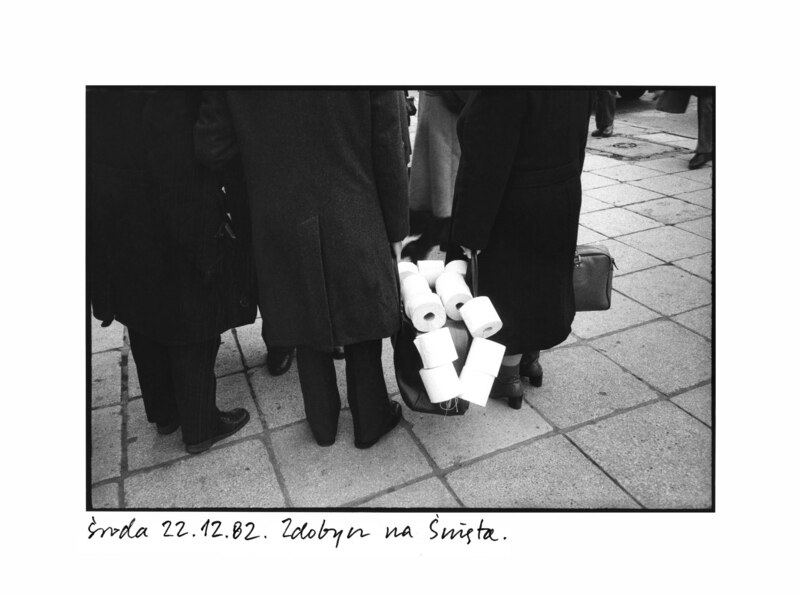 In the first Photodiary exhibition, It’s Been Almost a Year, at the Cracow ZPAF Gallery (1983), the censors withheld over 30 images out of a total of 230. What proved most controversial was the caption under a picture showing General Wojciech Jaruzelski on TV: ’13 December 1982. The General reminding us what he did a year ago’. The picture itself was okayed, but the caption was blanked! 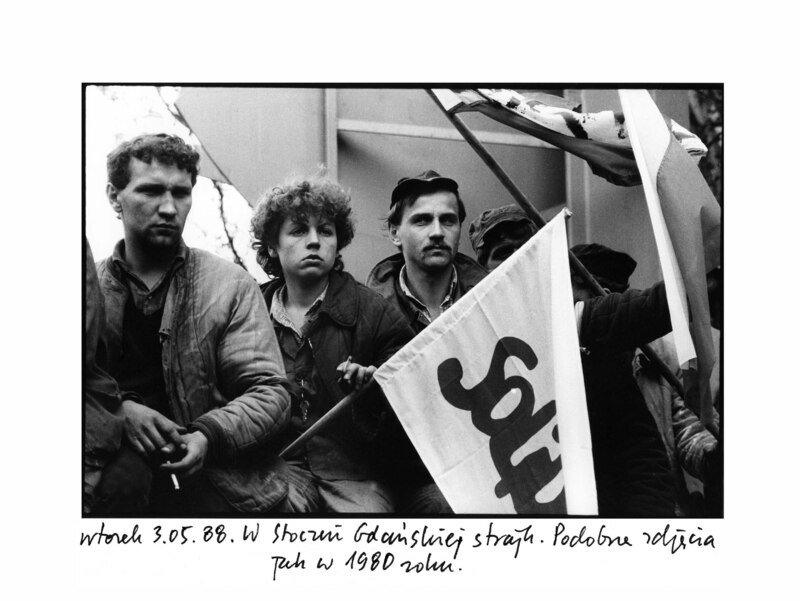 During the 15th Photographic Confrontations in Gorzów Wielkopolski (1985), a censor used a piece of wire to remove pictures documenting Father Jerzy Popiełuszko’s funeral from between the glass panels. Afterwards, when I requested their return, the organizers said the photos were in Warsaw, and the censorship office replied they were in Gorzów. I do not remember where the torn images eventually arrived from. The censors’ final attack took place in 1987 at the FF Gallery in Łódź; the entire exhibition was removed. Photodiary is a very private project, but in the 80's it was its political character which seemed most significant. When you lived in a country of the so called “real socialism”, there was no escape from politics. Even reading at night poetry of Josif Brodski, published in the underground, was a political act. Today we can read and write whatever we want but new totalitarianisms and new censors loom on the horizon. Globalization has swept us all. But Photodiary is still the same – private mixed with political. Now I often insert photos taken from TV programs to show events from all over the world I could not witness myself. I do not take photographs every day, but I have been doing it constantly for 32 years now. From hundreds of photos only some “fit” into the Photodiary. I put them in chronological order and that’s how my story is created. I could say – it’s getting done without any help. Despite many temptations I keep the same form: photos on square white background. Small size. Often I get bored with it, but it seems there is no better solution. Taking pictures became too easy, internet is packed with millions of photos and photo-blogs. Photographs seem to loose their value. Why add even more photos to this visual chaos? What keeps me on is the strong feeling that Photodiary is different and unique. When I press the shutter of my camera I feel under my fingers the unmerciful flow of time. It is painful. A man or an event which I am photographing irrevocably passes into the past and for a fraction of a second I move into the future, when I will be no more. Then I see my pictures trough the eyes of someone who may look at them in the future… Photography has always meant for me distant past, or far future. Never the present.